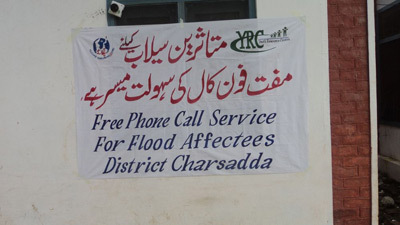 The telecoms emergency aid charity, Telecoms sans Frontieres (TSF) says that it has now set up eight centres in Pakistan to assist aid agencies with communications services and help stranded locals phone relatives to assure them of their situation. The eight mobile teams, equipped with satellite and GSM phones, are based in the districts of Peshawar, Nowshera and Charsadda and plan to operate for at least a month. The teams are composed of one man and one woman to allow both men and women to make a call. 3 Social Organizers were also recruited to inform the population of the service in the areas surrounding the operations so that a maximum number of people affected are aware of the service and given a chance to call. Within two days (20-23 August), 945 families were offered a free call (23% of international calls) in schools or camps and shelters along the roads. For many people, the call provided by TSF is the first call since the outbreak of the disaster. Many victims have lost their mobile phone or are in places with no electricity to recharge or simply have no money to buy credit. If needs are covered in the respective districts, teams will operate in other flood-affected districts of Khyber Pakhtunkhwa. These operations could last up to one month to offer the chance to as many families as possible to make calls, give news and ask for dedicated assistance.